Stack Overflow is scheduled for an election starting next week, November 7th. In connection with that election, we will be hosting a Q&A here for candidates. This will be an opportunity for members of the community to pose questions to the candidates on the topic of moderation. Participation is completely voluntary. This is similar to the Q&A sessions we've done in previous elections, but this time we'll be collecting questions a week in advance to the actual election running. Until the nomination phase, (so, until Monday, November 7th at 20:00:00Z UTC, or 3:00 pm EST on the same day because naturally it's right after Daylight Savings Time, give or take time to arrive for closure), this question will be open to collect potential questions from the users of the site. Post answers to this question containing any questions you would like to ask the candidates. Please only post one question per answer. If your question submission includes a link, please either use a raw URL or use the [text](url) syntax. A 10k+ user regularly has their comments flagged as "rude or offensive" or "not constructive", to the tune of 4-5 flags a day. No comment by itself is particularly offensive, but their general tone causes them to be flagged by multiple users. You've contacted them privately about this, but they believe that they aren't doing anything wrong and that people are being too sensitive. The flags keep coming in on their comments. What, if anything, do you do next? How would you, as a moderator, deal with a situation where a group of users unanimously disagree with your ruling while you're 100% sure you based your decision on the standing policy? What if your ruling was in a chatroom? Not everyone agrees with every Stack Exchange policy, guideline, section of scope, etc. 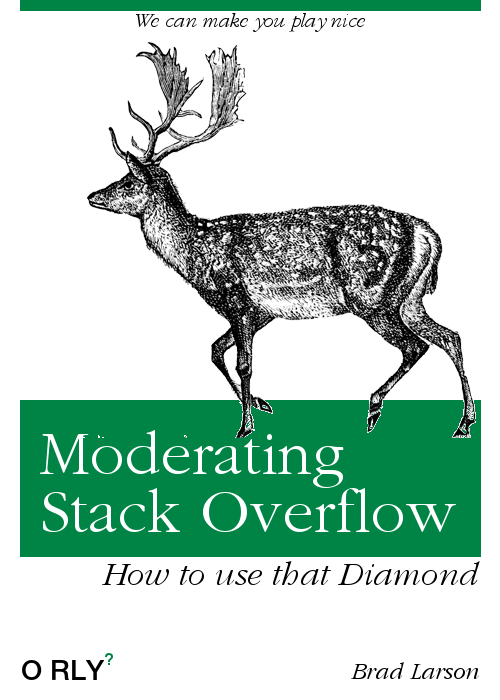 As a moderator, do you think you'll be able to effectively moderate and enforce Stack Overflow policies you may personally disagree with, but which the community strongly supports - or, as Aaroninus suggested, perhaps which you and the community disagree with? A user vandalises their post and enters a "rollback war", trying to change it to simply read "QUESTION REMUVED FOR PRIVACY". They had also submitted (rejected) suggested edits to do likewise to the answers. The question was pretty poor to begin with, but received 3 decent answers and had been edited a little before the vandalism started. Moderation sometimes entails seeing some questionable content. Are you willing to take that risk? If you'll be moderating at your workplace, do you have a corporate filter that will take issue with this? How would you act on a "NAA" answer which is flagged as VLQ, or vice versa? You impose a temporary ban (say 1 week) on a user for what you judged as reasonable and valid reasons (the user gets notified by email of your action and the reason). The user replies to your email acknowledging the transgression, says they won't do it again and asks for the ban to be lifted. The user sounds genuine. The context of this question applies to longer bans too. If it helps get the juices flowing, consider the situation of a second offence for the same behaviour, which has a default ban period of 1 month. Bit of an edit from here. Mods get a lot of criticism, and while I haven't seen this recently, I have seen something similar in the past. Your future close-votes will be binding and hold more weight. You will be able to close questions on your own, without the assistance of 4 other community members. With that in mind, will you cast more or fewer close-votes than today? Being a moderator you will able to close questions on your own and override other community votes. Will this change how you vote to close questions? When faced with the decision of whether to delete a post, how do you determine whether the post "makes the internet a better place", as in this answer to About significance of questions and whether or not they should be deleted? Other moderators and employees seem to believe that if a question has been closed, it should eventually be deleted, as in this answer to the Meta Stack Exchange question "off-topic questions should be deleted rather than closed". Or do you have some other determining factor(s) for deletion? As @rene brought up in a comment, if you are reluctant to cast the binding vote, what about when you are asked to reverse deletions performed by the community, as in George Stocker's answer to Assisting with godaddy deletions? Or in the case of repeated delete/undelete cycles as in Why are we able to vote to delete or undelete over and over again? A user flags a post or comment as rude or offensive to a minority group, or as a member of a minority group. You know little about the issues facing this minority group and the post would not be offensive to the majority of users. As moderator, you are put into a hard place deciding between deleting or locking "popular content", that may or not adhere to current content policy. Do you believe in this dichotomy? How would you be able to sort out this situations? [My actions as a moderator have] resulted in some pretty intense social media stalking on my Facebook and Twitter, ranging from personal insults to attacks on my professional LinkedIn profile. Other moderators have had disgruntled users repeatedly phone their place of work trying to get them fired. Are you prepared to handle such threats? How would you react if this happened to you? Robo-reviewing is a major problem on Stack Overflow, because it actively encourages bad content. As a moderator, you will be able to temporarily suspend users from review. You will also be able to temporarily suspend users from editing. How do you intend to use your power to temporarily suspend users from review, and from editing? What kinds of reviewing do you consider good, and what kinds of reviewing do you consider bad? Similarly, what kinds of edits do you consider good, and what kinds of edits do you consider bad? How much evidence do you believe to be required, to justify a review suspension or edit suspension? You come across a typical question that's asked on a daily basis, one that you know has a good duplicate target on SO. What, if anything, do you do? Note: I'm talking about questions that have a dupe target as their first google search result. The famous canonical ones that get asked again and again. There's a sudden glut of chat flags and, upon investigation, you discover several people apparently arguing and flagging messages in a private room. To top it all off, they're not arguing in English either. The meta OP is concerned that future visitors will trust the hefty score and check-mark and feels that the few informed down-votes will forever lose to the endless stream of casual up-votes. Indeed, after a week of concerted scrutiny and 100 downvotes from meta, the answer still has an overwhelmingly positive score and continues to earn upvotes. Recently I asked a question on Meta: How to handle multiple duplicate and low quality answers on popular questions? and I haven't received any answers. What is your solution to this problem? Would you delete such answers? How will you handle questions flagged for migration on sites you are not active on? Context: this is in relation to this inflammatory question asked during last elections. What is your view on a moderator failing to correctly review a fairly obvious bad post? Do you think a moderator's actions should be exemplary, at all times? What is your definition of "spam"? What would it take to convince you to mark a post as "spam", with all of its associated penalties? More generally, under what circumstances would you use your moderator powers to unilaterally delete (remove) a post, assuming that it had been flagged by at least one community member? In other words, what specific problems would a post need to have before you would feel comfortable deleting it outright? The user is not flagged for any other offensive action (comments/ vandalism/ self-promotion). The user has been recognized for many good (great) contributions over the period of his/her membership. This time, if a ban kicks in for voting irregularities, what should be your verdict for the particular account holder? Keep the account active, just keep on increasing the ban timeout (Con: More voting irregularities to be followed, expected). Any other measure to handle this scenario. Q: A user with less than 2,000 rep is on an edit spree, changing nothing more in all the posts they're editing than one or two small word(s), and their edit is either incomplete or is not an improvement of the post each time. They're up to 45 similar/identical edits in the course of an hour, and a majority of these are being approved by reviewers that aren't paying attention. How do you handle this editor and the reviewers? How would you handle a similar situation with a user who has full editing privileges? In what direction would you like to help steer SO moderation? How would you prioritize differently? Our current moderators are doing great work. Nevertheless, in my opinion, there is a bit too much of _________ and not quite enough focus on __________. In my tenure as moderator, I would put the spotlight on ________ and not so much on _________. What's your view on code only answers? Do these warrant flags? If so, what flag and should they be deleted? What do you think is the moderator's role in the task of engaging novices in the SO community? Consider that this type of user usually makes mistakes in the daily use of the site and that the experienced users may not have patience with these mistakes. If you have run for moderator in a previous election, what do you think kept you from winning and how have you improved since? Regardless of whether you've run before, how would you like to grow in the next year and how do you think moderating SO fits into that? Let's talk about review queues. Once you are elected, how long would it take for you to get used to the fact that your reviews are binding (and you can decline flags via reviews)? Will you participate in Close Votes? I'm not asking what you think about SO Close Vote Reviewers - since your close votes are binding as well as your reviews, you don't have to team up with other users in order to make a dent in this gigantic queue. There seem to be three types of manually raised custom flags in the moderator-only flag queue - those that report important issues that actually need mod intervention (e.g "Multiple unregistered users posted now-deleted non-English answers to this question. Something fishy is going on here"), those that report everyday issues that are moderation-related but can be handled by the community or already covered by canned flags (e.g "This post is too damn rude" or "This is a well-written feature request that was posted on the main site - please migrate to Meta"), and those that aren't about moderation at all (e.g "Please answer my question"). Which type of flags would you prefer to focus on? Am I free to express my feelings toward some SO participant on my own blog outside SO? Should questions destroyed as being offensive be used as review audits?